One of the most fascinating hill stations in India, Coorg is famous for its enchanting landscape and its natural bounty. A treasure trove for Karnataka's Tourism Industry, it is one of the most frequented hill-stations in South India. An ideal abode of peace and resplendence, the place harbors some of the major tourist spots of the country. Find out more about its various tourist attractions that can be included in the sightseeing tours to the place. The district headquarters of Coorg and a picturesque town atop the Sahyadri mountains, Madikeri is known as the Scotland of India. Formerly known as 'Marcera', it is located at a distance of 252 km from Bangalore and is placed at an altitude of 1525 m (5000 ft) above sea level. Madikeri Fort, located at Madeikeri, was built in the 19th century. The monument houses a chapel, a temple, a prison and a museum inside. One can have a breathtaking view of the whole Madikeri town from this fort. According to legends and folklore, the Kodagu Kings spent their evenings in this place, which is a spectacular garden in the town of Madekari. One can have an impressive view of the sunset from this place. This wildlife sanctuary, which shelters elephants, tigers, spotted deer, leopards, bison, peacocks and other exotic wildlife, is a favorite among the tourists. There are lodging facilities inside the park, which makes it a much-visited tourist spot. The Iruppu Falls harbor a Hindu temple and serve as a place of pilgrimage for the various tourists visiting Coorg. The temple is believed to be dedicated by Lord Rama to Lord Shiva. Owing to its enchanting beauty, this waterfall is also a famous picnic spot. Located amidst a valley in a coffee-cardamom plantation, 7 km from Madikeri, are the Abbery Falls. 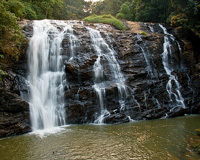 With water falling from a height of 70 ft, this is a famous waterfall and a much-visited picnic spot of Coorg. Talacauvery is the birthplace of the river Cauvery and is located at a distance of 44 km from Madikeri. A major religious site, it is visited by local Coorgs and even people from Tamil Nadu and other nearby states. They visit the place to take a dip in its holy waters. Built in 1820 AD by Lingaraja, this is a well-known temple in Coorg. With its immaculate architecture, that blends Gothic and Islamic style, this temple is believed to be dedicated to Lord Shiva. Bhagamandala is a famous shrine, where river Cauvery merges with the rivers Kannike and Sujyothi and forms the "Triveni Sangama". It is located on the bank of the Sangama River and has been built in the Kerala style of architecture. While on a tour of Coorg you can also visit other popular tourist destinations in South India, such as, Mysore, Hassan, Srirangapatna, Pattadakal and Bangalore. In Mysore you can visit Mysore Palace, Chamundi Hills, Nandi Bull statue, and Vrindavan Gardens and Musical fountains. Hassan was the seat of Hoysala empire. Some of the popular tourist attractions located near Hassan are Belur, Halebidu, Chennakesava Temple and Shravanbelagola. Shravanabelagola is one of the most important Jain pilgrim centers. Srirangapatna was the capital of King Hyder Ali & his beloved son Tipu Sultan. Ranganathittu Bird Sanctuary is located in Srirangapatna. Pattadakal is a World Heritage Site and is famous for Chalukya era temples.